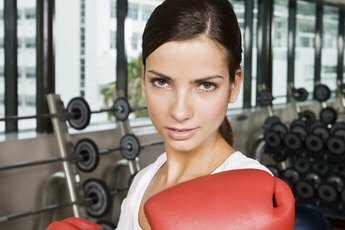 Approaching your workout with intensity can help you drop weight quickly. You pulled on your skinny jeans and noticed they felt a little snugger than you would like. You are ready to shed those extra pounds quickly and are willing to put in the effort of breaking a sweat and going all out in your cardio sessions. These intense workouts make your heart rate skyrocket, which can help you peel off some of those frustrating pounds. If you eat fewer calories than you use, then you lose weight. As simple as that sounds, applying this theory isn’t always as easy. A good place to start is to determine how many calories you need every day to maintain your weight. A basic way to calculate this is by multiplying your current body weight by 15. Safe weight loss is considered 1 to 2 pounds per week. To lose a pound a week, you need to create a deficit of 250 calories per day; to lose 2 pounds, you need a deficit of 500 calories per day. This deficit can be created through a calorically restricted diet, physical exercise or a combination of the two. When you work out, you want to make sure you are at a high enough intensity that you burn lots of calories. The more calories you burn, the faster you can lose weight. You can gauge your intensity with a few body clues. Vigorous cardio should feel challenging. Your breathing should be deep and rapid and you should break a sweat within a few minutes. While you are working out, you shouldn’t be able to say more than a few words per breath. High-intensity, or vigorous, cardio is considered running, swimming laps, playing singles tennis or riding a bike up hills. When it comes to weight loss, it's all about burning more calories than you eat. When you work out, your heart rates increases, which increases how many calories you burn. But in regard to weight loss, working out harder might not be the most effective way to lose weight. A study published in the “Clinical Journal of Sport Medicine” found that the duration of exercise is more important than intensity for weight loss. The study placed 200 women in four separate groups: high intensity with high duration, moderate intensity with high duration, moderate intensity with moderate duration and high intensity with moderate duration. The study found that the group that walked at least 150 minutes per week lost the most weight. While all forms of aerobic exercise can help you lose weight, research shows that high-intensity interval training is the most effective form of exercise for losing abdominal body fat. A study published in the “Journal of Obesity” compared individuals who walked or jogged at a moderate intensity to individuals who did repeated brief all-out intensity sprints followed by a low-intensity recovery period. In addition to helping you lose inches around your waist, this form of exercise improves your fitness, skeletal muscle mass and insulin resistance. 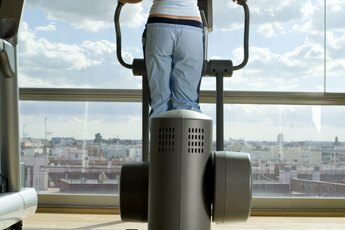 Does Low Intensity Cardio Burn Fat Better? How Many Calories Should Be Eaten in a Day With a Body Weight of 200? How Many Pounds Per Week Should You Gain or Lose? Are Shadow Boxing Rounds Good for Cardio?